Can you confirm these amateur observations of Archelaphe bella? chapaensis: Vietnam (Bac-Phan), Myanmar, China (W Yunnan); Type locality: near Chapa village (= Sa Pa), Bac Phan province, N Vietnam. Diagnosis Diagnosis. 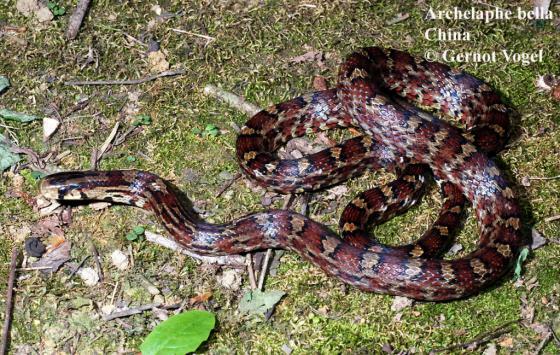 An old, isolated clade of relatively small- growing ratsnakes (total length 800 – 1000 mm) within the collective genus Elaphe auct. which branched off af- ter the Rhadinophis and the EuprepiophisGOreocrypt- ophis clades (Burbrink and Lawson, 2007). From the lat- ter two genera, it is distinguished by (1) a weakly (vs. markedly) concave frontal shield; (2) a consistently lacking loreal shield (present in Oreocryptophis and Euprepiophis, lacking only excep- tionally in some E. mandarinus); (3) a dorsal head pattern of an anteriorly open V- or Y-shaped marking (vs. a posteriorly open V-shaped marking in Euprepiophis, or a longitudinal midline streak in Oreocryptophis); and (4) its hemipenis with a slightly expanded, calyculate and indistinctly asymmetrical apex (vs. subcylind- rical, spiny and bilobed in Oreocryptophis, and distinctly expanded, spiny and asymmetrically bipartite in Eupre- piophis mandarinus and perlaceus, subcylindrical in E. conspicillatus). from Oreocryptophis: (6) the snout being 2.5 times longer than eye diameter (vs. 3 times in O. porphyraceus), and (7) by the 3rd and 4th labials contacting the (vs. 4th and 5th labial in O. porphyraceus, 3rd and 4th being an extremely rare exception). Comment Synonymy: WERNER (1929) established Zamenis brachyura Günther, 1866 (currently Coronella brachyura) as the type species of Wallophis, and allocated also “Coronella (Wallophis) pulchra” to his new genus. Wallophis was revived in a non-peer reviewed journal (Litteratura Serpentium), without adequate justification (by Ken Welch) and is thus not recognized here. Coluber leonardi WALL 1921 is a synonym of Coronella bella STANLEY 1917 (= Elaphe bella) fide SCHULZ (2000). See SCHULZ et al. 2011 for a more extensive chresonymy. Maculophis BURBRINK & LAWSON 2007 is a nomen nudum fide BÖHME & DE PURY 2011. Type species: Coronella bella STANLEY 1917 is the type species of the genus Archelaphe SCHULZ, BÖHME & TILLACK 2011. Etymology Derived from the Greek word archaios (= old), archaic, in reference to the basal position of the Archelaphe clade in the phylogenetic tree of Elaphe auct.